Let me begin by expressing my sincere thanks for the very warm welcome you have accorded me and my delegation. I also thank you personally for the invitation and the opportunity to be present at this annual national conference of Ahmadiyya Muslim Jama’at. Kindly extend fraternal greetings and salutations from the Government and people of Sierra Leone to His Holiness, Hazrat Mirza Masroor Ahmad, worldwide head of the peaceful Ahmadiyya Muslim community. As a country, we would like to express our very profound appreciation to his leadership. We wish to congratulate His Holiness for the tireless effort he has invested in establishing peace and brotherhood in the world. We have followed closely His Holiness’ “Pathway to Peace” international initiative that works toward achieving world peace through the teachings of Islam. Further, his World Peace Symposium since 2003 that advocates peaceful coexistence, and his inspirational book (The Path Way to Peace), speak to what the Ahmadiyya Mission in Sierra Leone has come to represent. Additionally, his continuous messages of peace and interreligious harmony broadcast on your radio stations continue to re-affirm Sierra Leone’s fundamental values of peaceful religious co-existence and fraternity. As a country, we send His Holiness messages goodwill. The Ahmadiyya mission has continued to remind us all that we are one, and of one Umma – a community of equals bound by Allah’s purpose. We are one because we continue being united by all the things that bind us together rather than those things that could blind us. We are bound by our common humanity and our faith that we can be better in the world, to the world, and to one another in every act of kindness and in every deed of compassion. Two years from now, the Ahmadiyya mission would have been in Sierra Leone for one hundred years. It has been one hundred years of living in and sharing our Sierra Leone, your Sierra Leone in peace and harmony. Since Missionary Nayyar’s first public lecture at the Fourah Bay Mosque in 1921, followed by the pioneering missionary work of Nazir Ahmed Ali, the Ahmadiyya mission has continued to enrich lives from Mange Bureh to Rokupr, from Baomahun to Bo, from Freetown to Magburaka, and throughout Sierra Leone. So let me commend the Ahmadiyya mission in Sierra Leone, first, in its focused efforts over the last nearly 100 years in investing in human capital development. Your mission aligns with my government’s core belief that by investing in education and training young persons, one gives them the opportunity to better themselves, their families, their communities, and their nation. I want to therefore recognise and formally commend your great investment in the intellectual, physical, spiritual, and moral well-being and training of millions of Sierra Leoneans. The Ahmadiyya Mission has built mosques, missionary training colleges, established radio stations to further spiritual education, and even translated the Holy Qurán into a local language. The mission has built two hundred and twelve (212) primary schools and sixty-four (64) secondary schools all over the country. 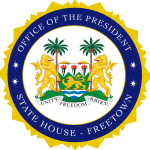 It has built and staffed hospitals and several clinics in various communities and continues to provide affordable healthcare to hundreds of Sierra Leoneans. We also thank the Ahmadiyya mission, the Ahmadiyya Jama’at, and related organisations for humanitarian interventions during our country’s hour of need during the Ebola scourge. Through Humanity First, the Ahmadiyya Mission contributed funds, held free medical camps, and trained volunteers to contribute to the nationwide sensitization campaign. The mission also supplied food and clothing to quarantined homes and cared for the welfare of Ebola orphans. By providing food, water, shelter, and clothing for the most vulnerable of our citizens, you have demonstrated again and again the power of compassion and kindness. My Government also recognizes the Ahmadiyya mission’s partnership with our government in implementing various poverty alleviation schemes and other socio-economic activities. The housing schemes provided by the International Association of Ahmadi Architects and Engineers are remarkable pioneering ventures. The agricultural projects have helped enhance the skills of farmers, provided them with equipment, seed, and fertilizer, and thus contributed to national food security. Hygienic water wells continue to provide potable water for our citizens. Solar energy installations have provided electricity in more than 50 mosques. Free vocational IT training provides opportunity for the youth. What better ways to live up to the inspirational motto of the Ahmadiyya mission: “love for all hatred for none”? What better way to cater for the whole of the human being? Let me conclude by affirming my Government’s staunch support for the mission and activities of the Ahmadiyya Jama’at. Your work in Sierra Leone has continued changing lives for the better for generations. May the peace and blessings of Allah be upon each one of you throughout your deliberations at this 55th annual religious conference.